Mantras are central to religious experience in India, found in all modes of ritual and practices, and accompanying all life events from birth to death. While mantras ground meditative practice and the many paths to liberation, they are also applied for magical power, alchemical transformation, and medicinal purposes, and for prosperity in various phases of life. Found in the earliest Vedic literature, mantras transcend Hindu culture and are also found in Buddhist, Jain, and Sikh traditions. Even within Hindu culture, mantras defy a single interpretation. The understanding of mantra found in the Vedas, Tantras, and folk traditions often overlap and shift. Subsequent traditions utilize some of the earlier mantras, changing their meaning, ritual, and visualization. The concept of mantra cannot be reduced to a single interpretation, and understanding some characteristics is required to identify mantras. In general, speciﬁc lineages assume traditional authority in transmitting speciﬁc mantras with a focus on the oral instruction. 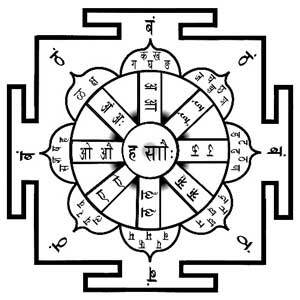 Receiving a mantra, thus, becomes identical to receiving ritual initiation (dīkṣā). Mantras are considered to be divine revelation, and the authorities, the Ṛṣis in the Vedic tradition and Siddhas in the folk pantheons, are considered capable of ‘hearing’ the cosmic resonance. The power of mantra is believed to transcend its linguistic ability to signify something, and they often defy the rules of spoken language. Thus the efﬁcacy of a mantra relies less on grammatical correctness than on its precise articulation. Distanced from common language, a mantra can also be an acronym of the names of deities or of various mantras. Mantras are often identiﬁed with distinct deities, and just as the images of the deities receive rituals of life-installation and worship, so also do mantras. Here, mantras assume their own personalities. When mantras are applied in speciﬁc rituals, their very nature shifts accordingly. Mantras, then, are often ﬂexible; they can be used for different and sometimes contrasting purposes. 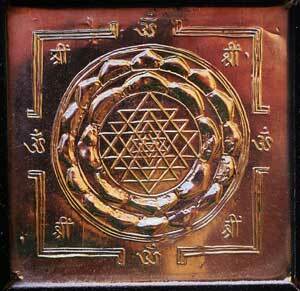 This application of mantras often relates to the construction or visualization of various geometric designs. Although the incorporation of geometric designs for rituals that require chanting mantras is found in both Vedic and Tantric rituals, the interrelationship between mantra and maṇḍala becomes prominent in the latter. In the Tantric depiction, just as peripheral deities are considered to be emanations of the central deity, the mantras of the deities in the circle are considered to be limbs of the core mantra. Tantras often reverse the Vedic ritual paradigm by placing a mantra at the center of the ritual, and in many cases, the recitation of mantra replaces the ritual itself. In this changed paradigm, the mantra is regarded as the foundation for reﬂection, and the mental resonance of mantra is considered to be more powerful than its vocalic articulation. The composers of the Vedic mantras are called ‘seers’ (Ṛṣis). The Vedic citations identiﬁed as ṛc are metrical and are loudly pronounced, whereas the yajus sections contain prose to be uttered slowly in various ritual contexts. Vedic tradition stresses exact articulation, and variation in chanting gives rise to different branches of the Vedas (Carpenter 1994, 19-34). As rcs are associated with deities, mantras identiﬁed as yajus are linked with rituals. The sāman is metrical and chanted with musical effect. The mantras in the Atharvaveda are often linked to magical effects. The concept of speech (vāc) as divine is at the core of mantra. In the Vedic world, speech is considered to be the teacher of gods, immortal, and of the nature of light. Due to the stature of the Vedas in Indian society, vernacular traditions occasionally link themselves to the Vedas. The authority in the Vedic paradigm concerns the power of speech, limited to that embodied by the Ṛṣis through their penance. Myths often highlight the seer’s power to transform reality through speech. As this is not simply linguistic signiﬁcation, authoritativeness is crucial to mantric identity. This divination of speech manifests in Indian philosophical traditions, on one hand, in the concept that the signifying power (śakti) of language is divine, and on the other, in the magical power of speech with its ability to transform reality. The repetition of mantras comes to prominence in the later Vedic period, with soft recitation in the morning and louder articulation later in the day. This stylistic shift in chanting evolves in the form of three recitations: low, inaudible, and mental (Patton 2005, 29). This structure of chanting unfolds with the divine vāc being not merely speech having power, but Vāc as the goddess of wisdom and the procreative force associated with Prajāpati, the god of creation (Holdrege 1996, 89-93, 105112). The vast gap between the Vedas and the Tantras is bridged through the concept of mantra. The deities invoked in the Vedas, the mantras associated with the deities, and the rituals differ greatly when compared to Tantric deities, mantras, and ritual application of those mantras. Vedic mantras are poetic in nature, which is not the case for Tantras. Despite differences, the mantra which embodies the concept of the power of speech, is central to both Vedic and Tantric traditions. Most Tantras attribute mantras to various Vedic seers, suggesting that their authority in Indian society remains undiminished despite the changed ritual context. 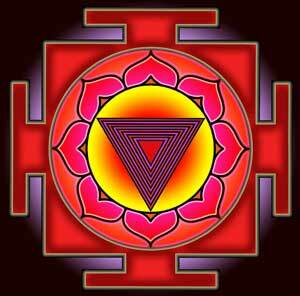 Tantras frequently draw upon the Vedic mantras. An exploration of the Gāyatrī mantra, which is both the most popular Vedic mantra recited today as well as a Tantric mantra, demonstrates the nuances added in transporting mantras from one to another context. GT delineates the detailed ritual, visualization, and application of this mantra. While the name Gāyatrī comes from the verbal root √gā or √gai, meaning ‘to sing,’ the mantra is no longer sung, but is quietly articulated or repeated mentally. 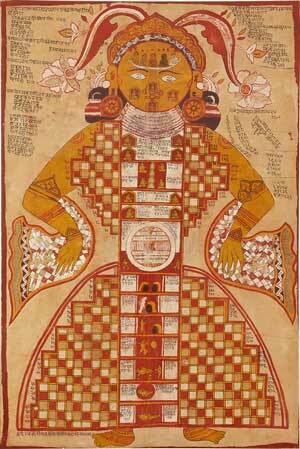 The deity of the mantra is no longer Savitṛ (the sun), but Sāvitrī, a goddess with benign anthropomorphic form. The mantra is no longer read only once in the ritual context, but is repeated many times. Each letter of the mantra links with distinct principles found in Sāṅkhya cosmology, and certain perfections are associated with letters of the mantra. The practice includes maṇḍala construction and worship, wherein various deities are invoked as emanation of the goddess Gāyatrī (PST, Chapter 30). Duplicating the Vedic Gāyatrī mantra, Tantras produce multiple versions, with each of the deities having its own Gāyatrī mantra. In the changed context, this mantra transforms to a ‘class,’ referring to a particular type of mantra associated with various deities. Adopting this structure, even peripheral deities in the mandala have their own Gāyatrī mantra. The Vedic understanding, that rituals constitute and transform reality, embodies the notion of the power of mantras, as there are no rituals without mantras. Another example of this process of adaptation and transformation can be found in the Śaiva Āgamas, which utilize ﬁve Vedic mantras in ritual visualization of the ﬁve faces of Śiva. These mantras are at the center of the Pāśupata vows and practices. The Svacchandatantra describes the Aghora mantra, associating it with Svacchanda Bhairava. Parallel to the Tantric practice of Gāyatrī, these Śaiva mantras change in the new ritual paradigm, not only in visualization and preparatory rituals, but also in the meaning of the mantra. They now correspond to various Śiva or Bhairava forms, and the practice includes the installation of mantras in the body, construction and visualization of a maṇḍala, demonstration of various gestures, and a high number of mantra repetitions. Various perfections and magical powers are associated with repetition of these mantras. These examples demonstrate the ﬂuidity of the Hindu traditions, and illustrate the shift of the ritual paradigm with the mantras remaining unchanged. The Vedic understanding, that rituals constitute and transform reality, embodies the notion of the power of mantras, as there are no rituals without mantras. The later Vedic concept that praṇava (Oṃ) is the source of the three planes of the cosmos typiﬁes Tantric exegesis, and the early Indian notion of penance (tapas) is reversed in later Indian culture, with mantras replacing rituals and penances. In the Vedic paradigm, one aspires to ‘see’ mantras, and be a Ṛṣi, whereas in the Tantric context, mantras are divine revelations and one aspires to achieve siddhis through the mantra practice. Mantras are often compared to weapons. Mantras that grant protection, identiﬁed as Sudarśana, Aghora, Pāśupata, Nṛsiṃha, Brahmā, and so on, and those given mythological names for weapons, highlight the paradigm of warfare. If practiced differently, mantras generate the opposite effect: the mantra for granting long life, when recited in reverse order, is applied as a mantra for killing. Read from back to front, the DM grants supernormal powers, and the Gāyatrī mantra carries out magical effects. Although the etymological and syntactic meaning of a mantra does not apply in these reversals, the concept of Mātṛkā generating power in the mantra is not challenged even in the changed sequence. Patañjali identiﬁes certain perfections achieved through mantras (YS 4.1) and these are clearly distinguished from those attained through tapas and absorption. In his commentary, Vyāsa identiﬁes perfections such as having multiple bodies through birth, agelessness and deathlessness through the application of elixir, powers such as manipulating body size through mantras, and the ability of shape-shifting through tapas (Vyāsa in YS 4.1). This categorization is not applicable to both Vedic and Tantric understandings, as they unequivocally proclaim the unparalleled powers of matras. 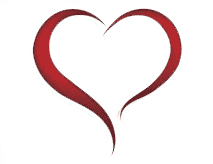 In Tantric practice, the power of mantras is discovered through acquisition of a speciﬁc state of mind. The gesture called khecarī, for instance, depicts the state of mind beyond thoughts, identifying it as the supreme state and origin (yoni) of all deities and mantras (NT 7.35-41). Mantras are considered more powerful in their seminal (bīja) form. Aham is one of these seed mantras that stands as acronym for all the letters and also for self-awareness (Padoux 1991, 386389). Mantras, along these lines, are the speciﬁc arrangements of the powers found in letters (mātṛkā), which are the ‘unrecognized mothers’ for bound individuals and divine forces for the realized ones (ŚS 1.4). The rise of powers that underlie these letters determines perfections, and when all the forces of these letters are concealed, one is bound and compared to a beast (SK 45). The realization of the divine aspect of the I-sense through the complete recognition of aham is therefore considered to be the essence of all mantras. The vigor (vīrya) of mantra is considered to be experienced through immersion in pure consciousness (ŚS 1.22 and Vimarśinī thereon). Tantras agree that the letters pronounced are not mantras if they are repeated without awareness. An aspirant merges his self-awareness with a mantra through ritual installation of mantras and through visualization, wherein the focus lies on the integration and dissemination of mantra and letters. The vigor of mantras is felt through the expansion of the self-awareness that embodies the cosmos (ŚS 2.3). The power of mantras parallels that of Kuṇḍalinī. As mantra stands for both its phonetic resonance and the awareness embedded in it, so does Kuṇḍalinī, with its relationship to life force (prāṇa) and awareness. Tantric texts such as ŚV discuss the physical effects of the rise of Kuṇḍalinī. The manifestation of mantric powers coincides with the awakening of Kuṇḍalinī. There are physical symptoms associated with this process, and the folk belief that mantras can be ‘dangerous’ and should not to be practiced without a proper guide. The cognitive and phonic aspects are inseparable from one another in mantras. Just as the sound of the mantra, its correct articulation, and the number of repetitions are equally important, both the Vedic and Tantric literature likewise stress that understanding the meaning of mantras is an integral part of mantra practice. Later Mīmāṃsā treatises state that ‘mantras call to memory things associated with some performance,’ suggesting that mantras used in rituals are meaningful in the ritual context, whereas others have ‘unseen’ (adṛṣṭa) meaning. Mantras are deciphered in different ways, with different perspectives that are valid. Exploration of several prominent exegetes and the traditions that endeavor to discuss the meaning of mantras follows. The philosophy of Bhartṛhari (5th Century) offers the greatest context to bridge the Vedic and Tantric understandings of the mantras. Although the scope of Bhartṛhari’s philosophy of language concerns not only mantras, it nonetheless provides deep insight into the classical understanding of the nature of ‘word’ (śabda), identiﬁed with Brahman. His concept of ‘word’ as the absolute, the concept of sphoṭa in which meaning is a unitary whole, and the analysis of speech at four esoteric levels are foundational to mantra exegesis in Tantric literature (Iyer 1992, 98-180). The concept of pratibhā, or the intuitive linguistic power, becomes the cosmic procreative force in Trika Śaiva doctrine, allowing the interpretation of speech at four levels, placing parā or pratibhā at the heart of the evolution of speech. In Bhartrhari’s paradigm, there is no distinction between word and its powers that materialize reality. Because of this intimate relationship between the absolute and the word principle, one who is aware of the reality of the word principle is said to realize the absolute (Sastri, 1991, 1-33). In the absence of this concept that bridges the absolute and the word, the realization of the self and attaining liberation through mantra would not be possible. 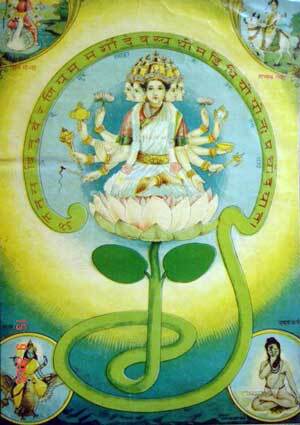 The Tantric understanding of mantra substantially depends upon the concept that there are various levels of speech. Following this principle, audible speech is merely the external form of the word principle that manifests ﬁrst in its selfrevealing stage identiﬁed as paśyantī. Addressed brieﬂy by Bhartṛhari, the concept of the levels of speech dominates the exegesis of mantra in Trika Śaiva and other Tantric traditions. Tantras add the category of the ‘supreme’ (parā) form of speech, describing it as consciousness itself, pulsating eternally, giving rise to both linguistic and material manifestation. This word principle is recognized as the non-dual awareness being aware of itself. In this self-awareness of speech, all that is to be cognized is cognized, and this is the foundation for the rise and collapse of names and forms (Padoux 1991, 172204). The self-seeing (paśyan) word principle, the śabda Brahman, appears as the ﬁrst pulsation and orientation toward creation. Tantras identify it as subsequent to supreme speech, awareness itself, where subject and object are not distinguished. The dialogue of the primordial couple Śiva and Śakti is related to this level of speech in Tantras. This self-seeing (payantī) speech is correlated with the power of will (icchā), which is found in consolidated form in the manifestation of the power of knowledge (jñāna), and in the power of action (kriyā). The ﬁrst throb of mantra found in paśyantī is of the character of vision, and can be compared to the visionary power of the seers in their ability to see the mantras. In other words, ‘knowing’ mantra is a singular audio-visual perception. This hierarchy of speech allows Tantras to develop their esoteric interpretation of mantras, where the subtle sound is more powerful, and sound and cognition merge in self-awareness. Mantra is the ground of speculation both for Mīmāṃsā exegesis and Bhartṛhari’s philosophy of grammar. These ideas predate most of Tantric literature and are the bedrock in the development of the Tantric interpretation of mantras. Furthermore, both Bhartṛhari and Trika Śaivites similarly embrace the doctrine of Ābhāsa, adopting the concept that the absolute appears in manifoldness without really being polluted or falsely projecting non-existing entities. In other words, utilizing both Mīmāṃsā and the philosophy of Sanskrit grammar for speculation on mantra is crucial to understanding classical mantra exegesis. Both Vedic and Tantric practice focus on deciphering mantras. There are millions of mantras and as many ways to decipher them. Due to space considerations, I will focus on the most widely known single syllable mantra, Oṃ, generally addressed as Praṇava. The letter Oṃ, identiﬁed as Praṇava, is the most widely circulated mantra. By analyzing this single syllable, the later Vedic, Smārta, and Tāntric approaches to interpreting mantras can be demonstrated. In order to describe the plasticity of mantras and their meanings, it is important to know how the same mantras are understood or visualized differently in different traditions. Praṇava makes a strong case for that as well. In the later Vedic tradition, Oṃ is visualized as the seed mantra that gives rise to bhū (earth), bhuva (the middle ground), and sva (heaven). This is also identiﬁed with the three sections of the Gāyatrī mantra, with each section considered to be the manifest form of a+u+m. These three letters successively refer to the waking, dreaming, and deep sleep states of the self at both cosmic and individual levels (see MU). The fourth state, awareness itself that transcends both the letters and triadic manifestation, is identiﬁed as the true nature of the self. The yoga system of Patañjali considers Oṃ as the signiﬁer of Īśvara, who is never bound by ignorance, the conditioned I-sense, passion, aversion, or death, and is eternally omniscient. Patañjali maintains that the repetition of Oṃ is the contemplation of its meaning, which is Īśvara. Tantras describe nine subtler layers in addition to the three letters of Oṃ. These stages refer to very subtle moments of time, all of which are to be visualized while pronouncing the mantra. Their location within the body, their visualization and correlation with speciﬁc deities, are all considered part of the meaning of Oṃ. Tantras also specify the seer, the meter, and the deity of Oṃ for meditation (PST 19.3). In light of these descriptions, the meaning of Oṃ appears to be the prescribed visualization that varies with each tradition. In other words, whatever is supposed to be brought forth in the mind when Oṃ is recited is the meaning of Oṃ. Patañjali refers to positive attributes such as omniscience as the subject matter for contemplation, whereas Tantras build a hierarchy of subtle grounds and describe this as the meaning. Deities to be visualized in each of the Śaiva, Vaiṣṇava, or Śākta traditions differ, and this visualization is identiﬁed as the meaning. Explicitly, the meaning of Oṃ cannot be separated from the context of recitation. Some observations can be made based on the above discussion of meaning. As highlighted already, ‘meaning’ here is mental rather than its correspondence to external objects, and knowing meaning is transformative rather than informative. It is the self, not objects, to be visualized and conﬁrmed as the meaning of the mantra. Knowing the meaning here is not simply knowing the way things are, but changing their previously cognized condition. As mantra is envisioned, so is its meaning construed. Understanding a mantra, following this, is a purely cognitive process that does not depend upon external reality for identifying the relationship between signiﬁer and signiﬁed. This article was drawn from a much larger entry, “Mantra,” in the Encyclopedia of Hinduism (Vol. 2). Editor, Knut Axel Jacobsen. Published in Leiden by Brill. 2010. Alper, Harvey P. (ed.) 1991. Understanding Mantras. Delhi: Motilal Banarsidass. Carpenter, David. 1994. “The Mastery of Speech: Canonicity and Control in the Vedas.” Essays in Vedic Interpretation: Authority, Anxiety, and Canon. (Ed.) Laurie L. Patton. Albany: State University of New York Press. Holdrege, Barbara A. 1996. Veda and Torah: Transcending the Textuality of Scripture. Delhi: Sri Satguru Publications. Iyer, K. A. Subramania. 1992. Bhartṛhari: A Study of the Vākyapadīya in the Light of the Ancient Commentaries. Poona: Deccan College. Padoux, André. 1990. Vac. the Concept of the Word in Selected Hindu Tantras. Albany: State University of New York Press. Padoux, André. 1991. “Mantras: What Are They?”, in Alper 1991, 298-318. Patton, Laurie L. 2005. Bringing the Gods to Mind: Mantra and Ritual in Early Indian Sacriﬁce. Berkeley: University of California Press. Sastri, Gaurinath. 1991. The Philosophy of Bhartṛhari. Delhi: Bharatiya Vidya Prakashan. Dr. Sthaneshwar Timalsina completed his Master’s degree in 1991 from Sampurnananda University in Varanasi, India, and taught for several years in Nepal Sanskrit University, Kathmandu. He completed his PhD from Martin Luther University in Halle, Germany (2005) with a focus on the history of the philosophy of Advaita. His dissertation is published under the title, Seeing and Appearance (Shaker Verlag, 2006). Before joining San Diego State University in 2005, Timalsina has taught in a number of institutes including University of California, Santa Barbara, and Washington University in St. Louis. His areas of research include classical Hindu, Buddhist, and Jain literature and philosophies with a specific focus on consciousness studies. His book, Consciousness in Indian Philosophy (Routledge, 2008) is a result of a comparative study between Advaita and Buddhist understandings of the self and consciousness. Timalsina also workes in the area of Tantric studies and his recent publications, Tantric Visual Culture: A Cognitive Approach (Routledge, 2015), and Language of Images: Visualization and Meaning in Tantras (Peter Lang, 2015), explore the cognitive and cultural domains of Tantric visualization. Timalsina has published over forty articles, book chapters, and review essays on religion, culture, literature, aesthetics, and philosophy. Timalsina teaches courses on Hindu, Buddhist, and Jain religious, philosophical, and literary traditions, and his teaching interests include ‘Religion and Science’ as well as ‘Yoga Philosophy and Practice.’ His current areas of research include theories of mind, with a particular focus on the cognitive aspects of recognition, memory, imagination, and emotion.